The latest watch from American brand Projects takes its unusual dial design from a drawing produced in the 1920s by influential Russian painter Wassily Kandinsky. The Diagram 17 watch features striking graphic elements that combine curved forms and straight lines. Milan-based designer Denis Guidone based these elements on a drawing of the same name by Russian artist Wassily Kandinsky – who is credited as one of the first abstract painters in history. The Diagram 17 drawing was originally published in 1926 in Kandinsky’s landmark essay, Point and Line to Plane. The hands of the watch are formed from two black lines of varying thicknesses, which turn independently of one another to create a constantly changing composition. Three thinner lines are static on the dial, while two half-circles follow the hours hand. Now available to buy from Dezeen Watch Store, Diagram 17 comes with a black stainless-steel case and a thick silicone strap. The dial is available in either black or white. Diagram 17 is Guidone’s second watch for Projects to directly reference abstract art. His Suprematism timepiece – also available from Dezeen Watch Store – pays homage to an art movement of the same name, which is defined by bold shapes and colours. Projects produces a wide range of household items designed by internationally renowned architects. But, since its founding in 1990, it has established a reputation for experimental, design-led watchmaking. Other timepieces by the brand include Scallop by the late Michael Graves and Kiura Chronograph by Italian designer Alessio Romano. Specialist Conor Jordan considers Wassily Kandinsky’s Rigide et Courbé (Rigid and Curved), unseen in public for more than 50 years and offered in New York on 16 November. 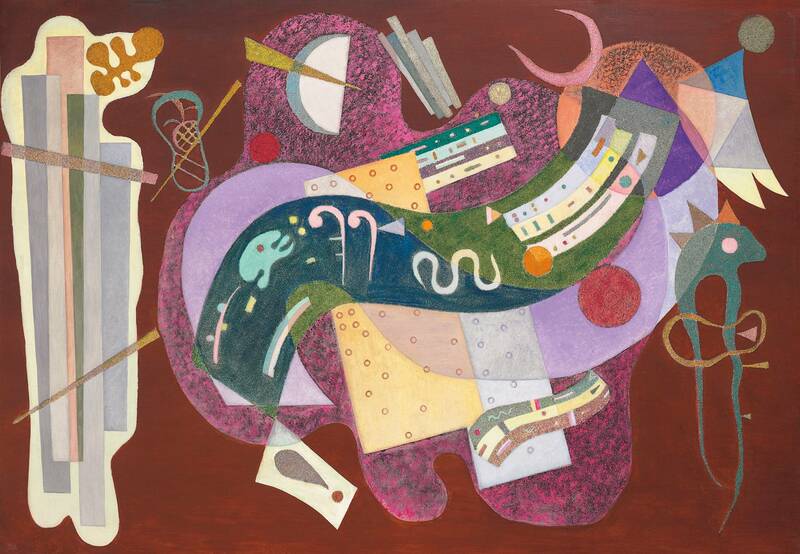 Wassily Kandinsky painted Rigide et Courbé (Rigid and Curved) in December 1935, marking the second anniversary of his arrival in Paris following the closure of the Bauhaus in Berlin. The canvas is densely packed with lively geometric vignettes and a textured surface composed of sand mixed with paint, a technique Kandinsky used only in his Paris paintings of 1934–1935. The painting was first owned by Solomon R. Guggenheim, who acquired it from Kandinsky in 1936. Extensively published and much exhibited between 1937 and 1949, the work is the most important Paris period painting by Kandinsky ever to appear on the market. ‘With its dynamic sweep of upward energy, Rigide et Courbé evokes a rhapsodic song of thanksgiving, suggesting the bright hope the artist saw in his new home in Paris following his flight from Nazi Germany,’ explains Conor Jordan, Deputy Chairman of Impressionist & Modern Art. Marcel Duchamp had found the artist and his wife Nina a three-room, sixth-floor apartment in a new building overlooking the river in the suburb of Neuilly-sur-Seine. The Kandinskys had taken up residence during the final days of December 1933. The bound shapes on one side of the canvas opposed by thrusting organic forms that press outwards suggest a veiled narrative of escape, release and the freedom to begin anew. Rigide et Courbé reflects the profound impact Kandinsky’s new French surroundings had had on his painting. Estimated at $18-25 million, the painting is being offered from an important private American collection and has not been on the market since 1964. The upcoming sale preview (Christie’s Hong Kong, 30 September to 1 October; Christie’s London, 6-9 October; San Francisco, 13-16 October) marks the first time in more than 50 years that the work will have been publicly displayed.